I did a (mostly) Italian-inspired recipe series on Facebook, and I thought I’d share the recipes here! 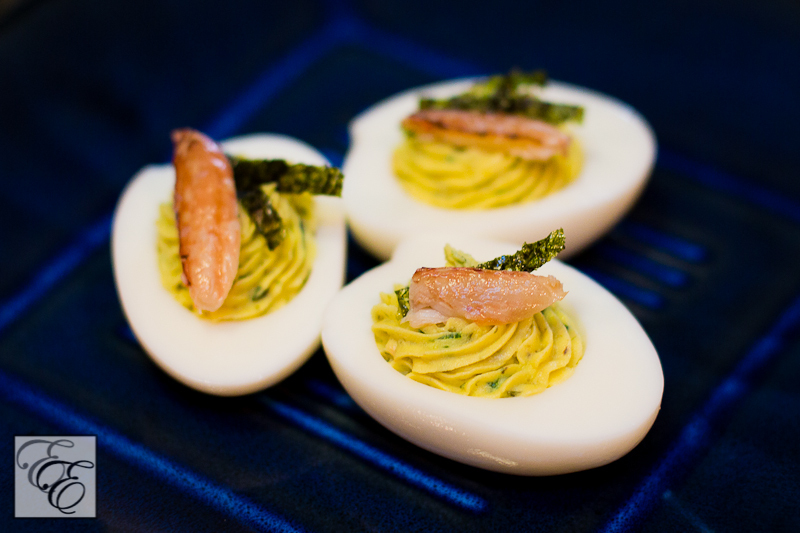 I hope these provide inspiration for easy recipes that are comforting and warming. Buon appetito! Preheat oven to 375 deg F. Coarsely mince the artichoke hearts into 1/3″ pieces. Add the mayonnaise, grated cheese, dried Italian seasonings, and garlic powder. Mix thoroughly. 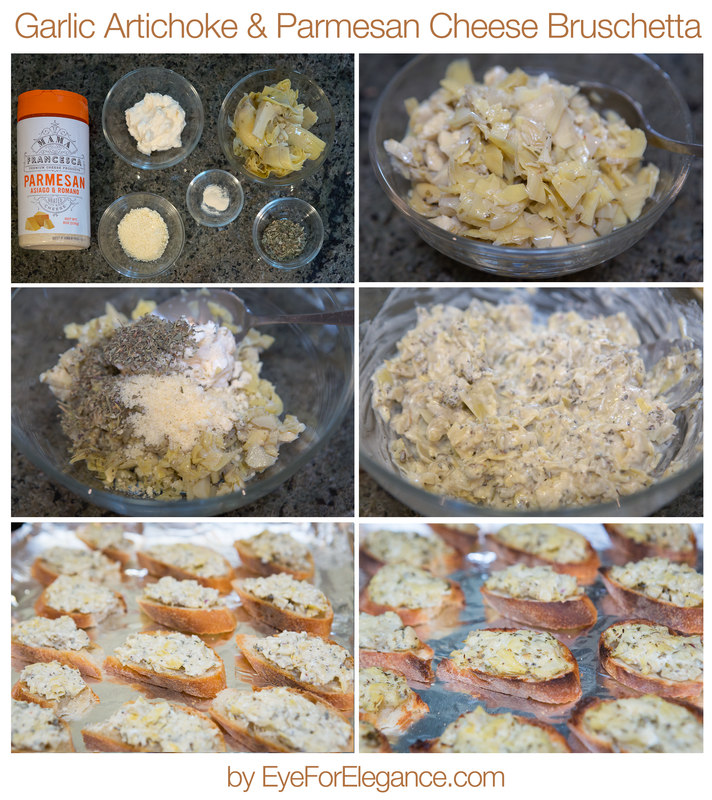 Using a spoon, spead artichoke mixture onto baguette slices, spreading to the edges. 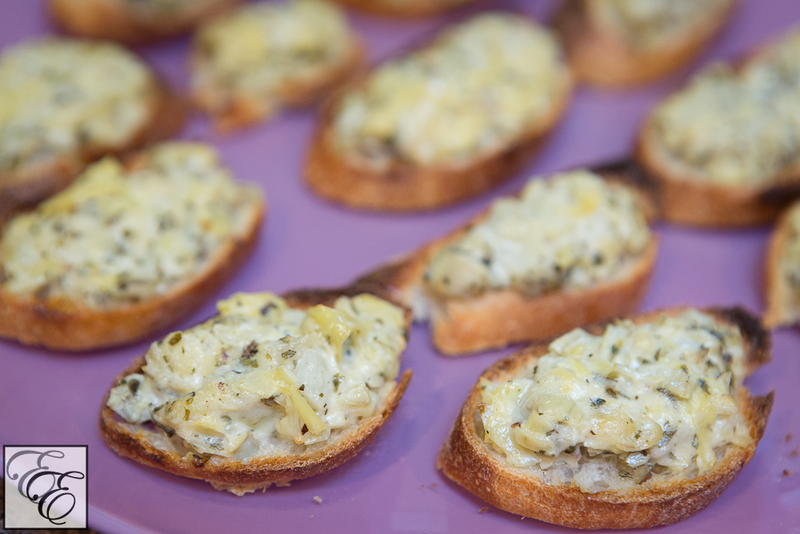 Place artichoke-covered baguette slices onto a baking sheet and place in oven. Bake for 8-12 minutes, or until slices are browned and artichoke mixture is hot and ‘melted’. Remove from oven, let cool for 1-2 minutes, and serve warm. Wash and halve the brussel sprouts and place in a large bowl. 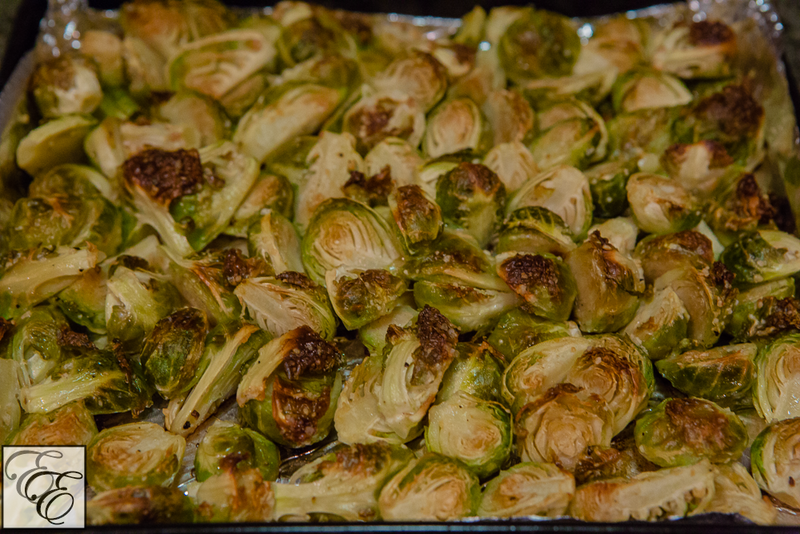 Preheat oven to 400 deg F.
Pour over oil and mix thoroughly together, massaging the oil over the brussel sprouts. Add salt, pepper, and cheese and mix thoroughly. 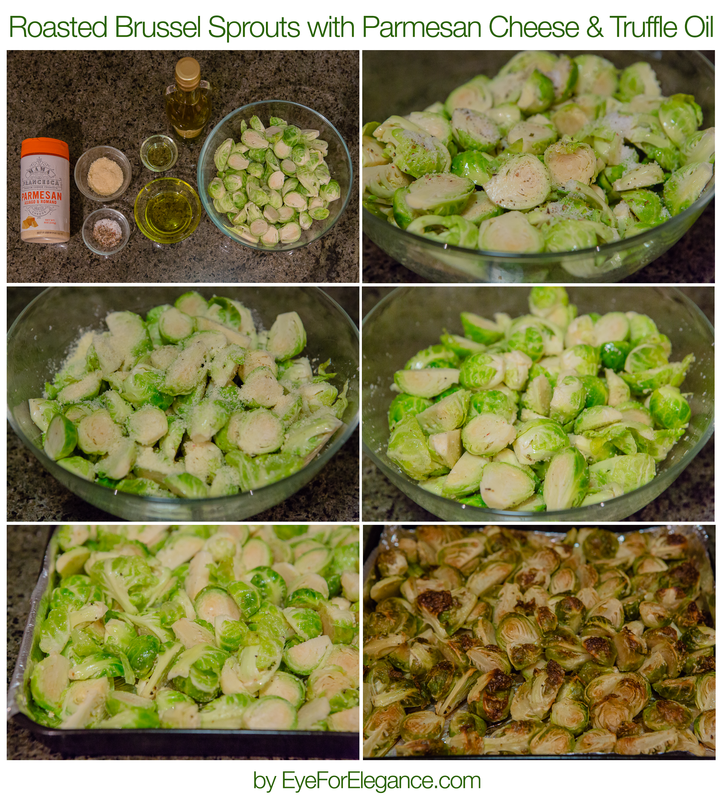 Place brussel sprouts in a single layer on a baking sheet and bake for 25-35 minutes, until outer leaves are well-browned and crisp. Remove from oven and toss with white truffle oil. Serve hot. 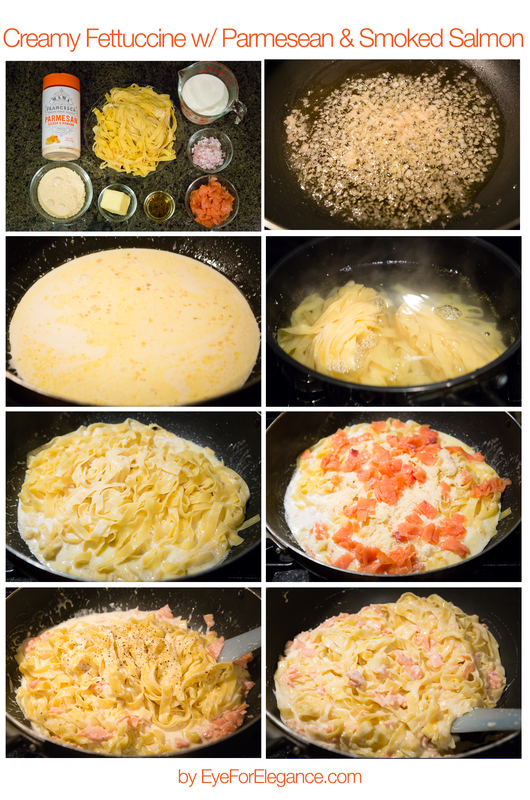 Melt the butter over very low heat in a sauté pan large enough to accommodate the cooked pasta, and add the shallot. Cook until slightly softened, 2-3 minutes. Add the heavy cream. Heat until the cream comes to a bare simmer. Turn off the heat and set aside. When the water comes to a boil, add 1 T salt and the pasta. Cook until almost al dente. Drain the pasta (reserving some of the pasta cooking liquid) and add it to the sauté pan. Add the milk, cheese, salmon, Scotch, ¼ t salt, and pepper to taste. 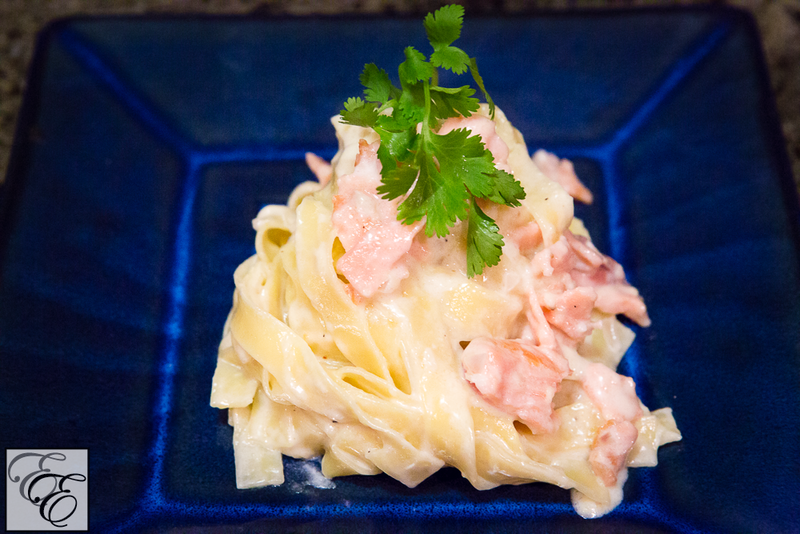 Cook over very low heat, tossing to combine ingredients, until the sauce is slightly thickened, 1-2 minutes. Add a little of the reserved pasta cooking liquid (or milk) if it is too thick. 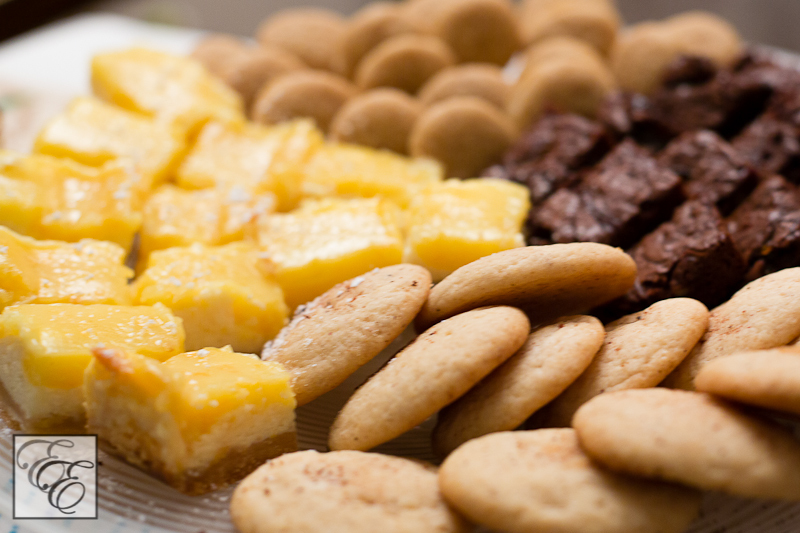 Divide among bowls or plates and serve. 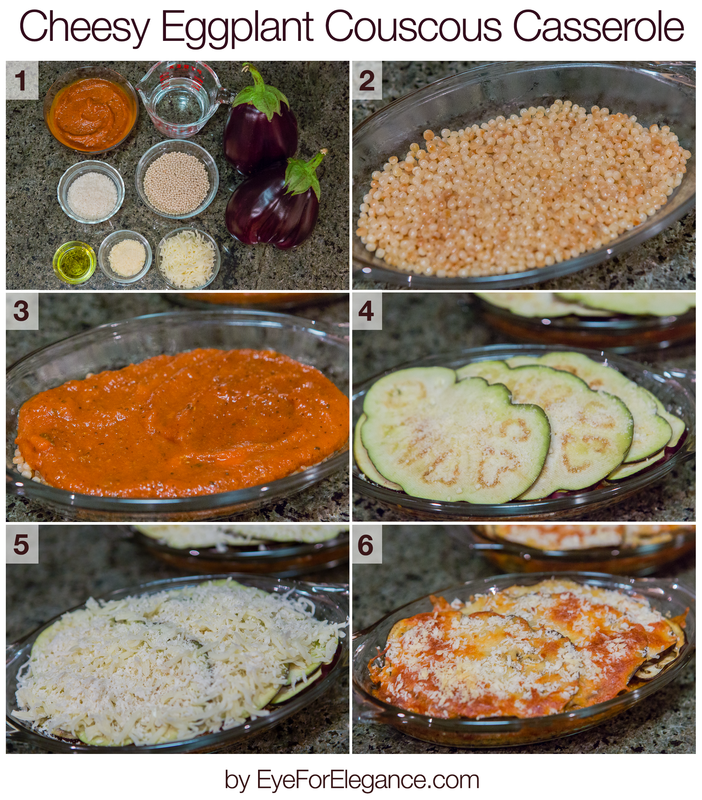 Cut the eggplant into thin (1/8″ slices, if possible), sprinkle with salt, and set aside. Preheat an oven to 375 deg F.
In a 1 quart saucepan, saute 1/2 T olive oil with israeli couscous over medium heat until couscous is lightly browned (about 5 minutes). Slowly add 3/4 C boiling water and bring to a boil. Reduce heat to medium low and cover. Simmer for 12 minutes or until liquid is absorbed. Remove from heat and spread into bottom of a casserole dish (two 4″x8″ individual-sized dishes or one 9″x5″ loaf pan). Layer the tomato sauce on top of the couscous. Drain any moisture that may have come off of the eggplant, and slightly overlap 1/2 of the slices in a single layer. Lightly brush with olive oil. Sprinkle with 1/2 of the Parmesan grated cheese. Layer the remainder of eggplant slices on top similarly, brush with olive oil, and sprinkle with the remaining grated cheese. Evenly sprinkle the panko bread crumbs on top of the casserole, and then evenly sprinkle the grated mozzarella cheese on top of that. Place in the preheated 375 deg F oven and bake for 35 minutes, or until the eggplant gives way easily when pieced with a fork and the cheese is golden-brown. Serve hot. Dice the sausage into 1/2″ cubes and the onion into 1/4″ cubes. Finely mince garlic. Preheat oven to 375 deg F.
Halve each zucchini lengthwise and hollow out with a small spoon, leaving a border of ~1/4″ thickness. Brush with olive oil and set aside. 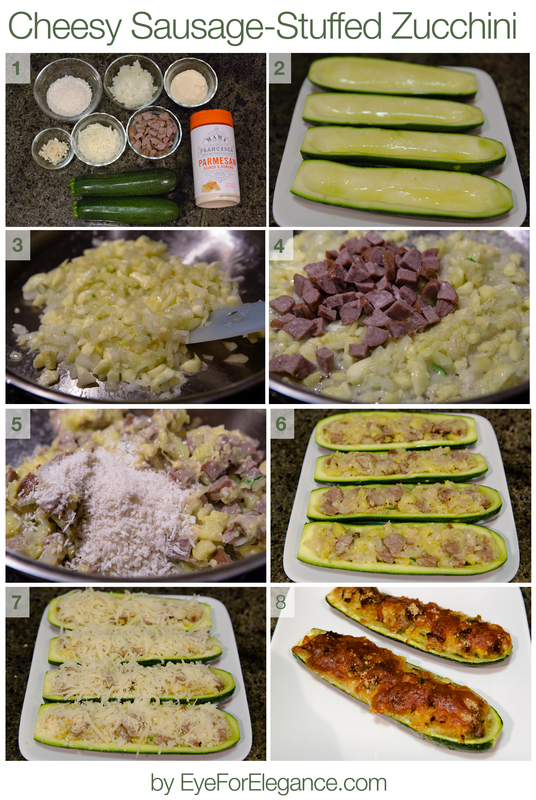 Take hollowed-out zucchini flesh and chop finely. In a small-medium skillet, heat a mixture of 1/2 t olive oil and 1/2 t vegetable oil. When hot, add minced garlic, onion, and chopped zucchini; saute until fragrant and tender, 1-2 minutes. 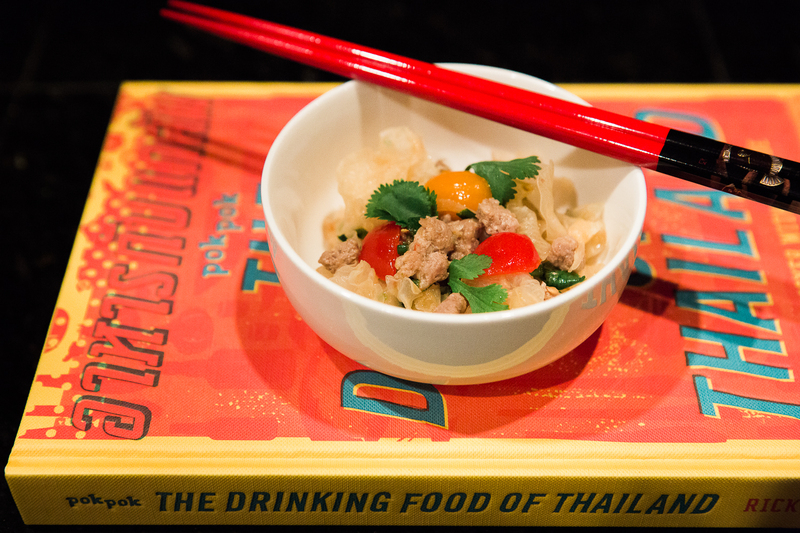 Add chopped sausage and saute for 1 minute. Add bread crumbs and Parmesan cheese, mix, and saute for 1 minute. Remove skillet from heat. Stuff zucchini halves with equal parts of sausage mixture. 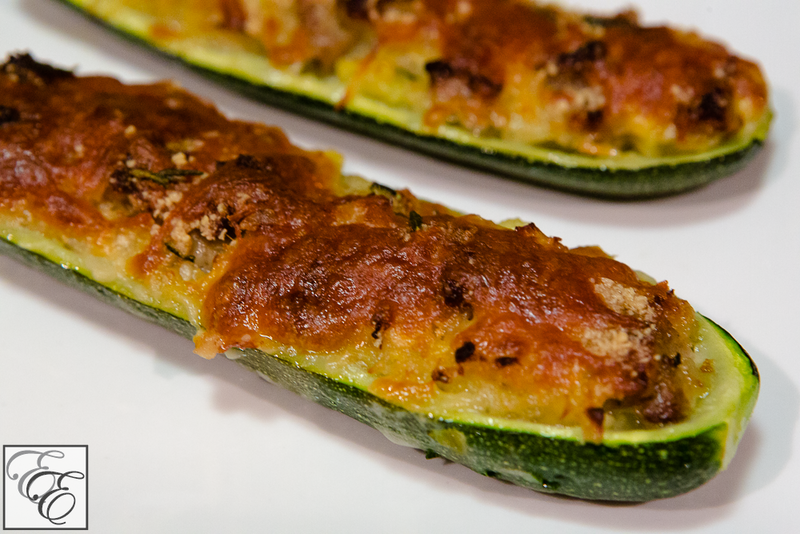 Sprinkle mozzarella evenly over the stuffed zucchinis. 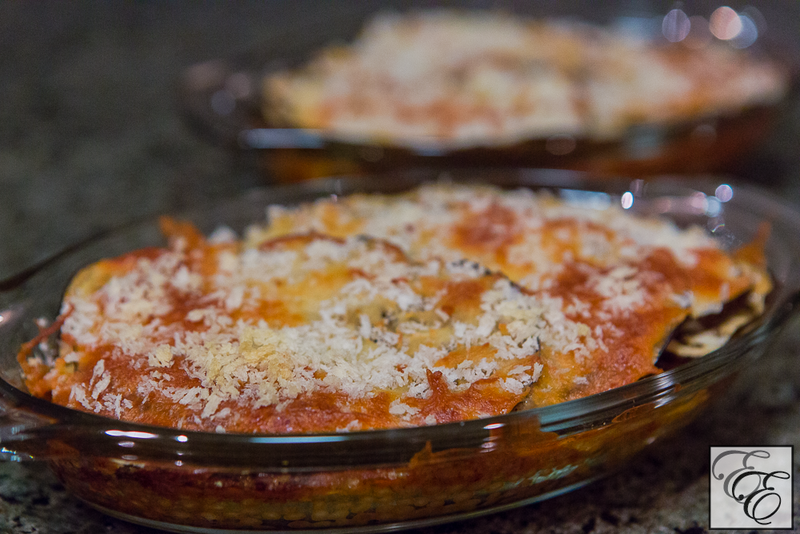 Place in oven and bake for 25 min or until zucchini is tender and the cheese is golden-brown. Remove and serve hot.